The Women’s Chic Knicker from Castelli provides moderate insulation and wind resistance for cool weather cycling in a lightweight, ergonomic package. 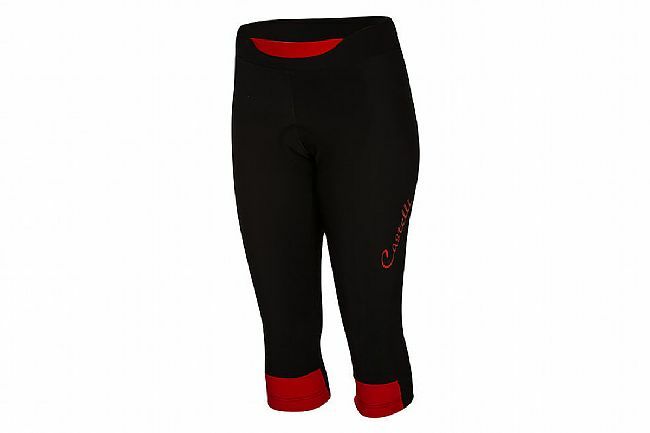 Made of Castelli’s plush, Thermoflex fabric, the Chic Knicker is soft against the skin and stretchy for a snug fit. The waistband features double-layered construction for non-restricting conformity. While lightweight, Thermoflex yields impressive insulation and moisture management. As the body warms and perspires, Thermoflex performs two functions: it traps a layer of warm air against the skin for ride-long insulation and transports moisture from the skin to the surface where it rapidly evaporates to regulate body temperature and maintain dryness. For comprehensive comfort and ergonomics, the knee cuffs feature articulated construction and an additional layer of fabric. The articulated knees mirror the bend in the knee for a more comfortable fit and greater freedom of movement. An additional layer of fabric at the knees ensures adequate joint protection - a necessity in cool and cold weather cycling. The Women’s Chic Knicker comes with Castelli’s KISS Air seat pad, featuring a seamless, brushed microfiber top layer with bacteriostatic treatment for reliable comfort during and after rides. Its anatomic shape and dual density foam with varying thickness - thicker in the ischial zone and thinner along the perimeter - provides optimal cushioning throughout the pad.